The theme is packed to the brim with great features like WooCommerce integration or Unlimited Portfolios. At a price that is less than a tank of gas there’s no reason not to get Total today and start building your new website! 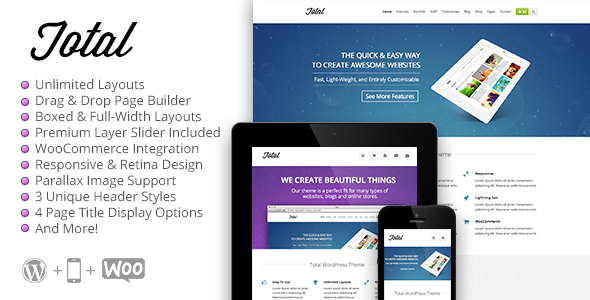 Item Reviewed: Total - Responsive Multi-Purpose WordPress Theme 9 out of 10 based on 10 ratings. 9 user reviews.